Smaller, less powerful version of the Sanctuary Guardian. 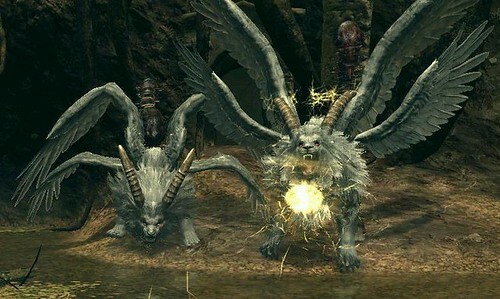 Two of them are found in the area where you fight the Sanctuary Guardian boss, after you defeat Knight Artorias. They respawn and provide another opportunity to obtain the Guardian Tail. It doesn't seem possible to sneak up on these things. They will face which ever direction you have spawned from at the bonfires. The Ring of Fog as well as the Slumbering Dragoncrest Ring don't seem to affect them, even if you wear both rings at the same time. In case of the Lesser Sanctuary Guardian, the tail has about 24.63% of his HP. If you want a Guardian Tail, you will need to engage both. The easy method - aggro a Sanctuary Guardian from within the cave with a bow. When they start shooting lightning, back up until all of the lightning gets absorbed by the ground while you can still see their tails. Manually aim at the tails until a whip drops. Note, they will jump back and forth a bit, but you are in no danger. If you accidently kill both Lesser guardians you will need to respawn them via bonfire.